The weekend rental allows you two full days at The Elms - all day Friday & all day Saturday! This includes time for decorating, time for your rehearsal & even for your rehearsal dinner! The Elms is also yours all day Saturday where you & your wedding party can prepare for your ceremony & reception. The Elms does all the set up and all the clean up. This package includes tables, chairs & tablecloths for 100 guests. The Elms is also available for an hourly rate Sunday through Thursday. The hourly rate is $200/hour on site, and time on site includes any time anyone related to your event is on site at The Elms. All of the same items and services listed above are included with the hourly rate as well! 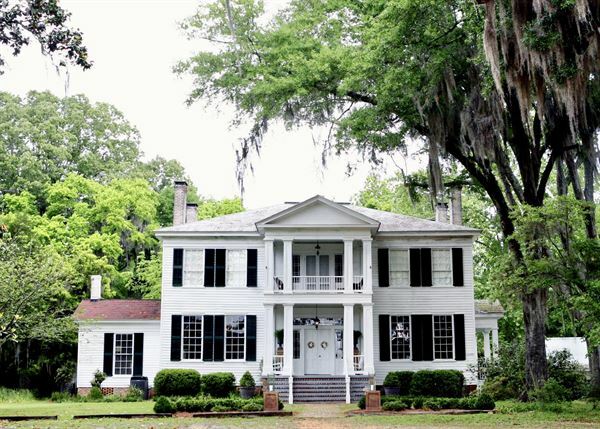 The Elms was built in 1836 and is listed on the Alabama registry of historic buildings. It is located in the beautiful countryside of Coosada, Alabama, on a lovely street, lined with old oak trees hanging heavy with Spanish moss. The home sits among nearly sixty acres of undeveloped land, yet it is only fifteen minutes from downtown Montgomery.